This page is about the monster entity that appears throughout the game. For information on the mission by the same name, see The Filth (mission). The Filth appears as the main threat in The Secret World and exists, in some form, inside every area of the game save for the city hubs. Calling it a living meme and the Anti-Anima, Lore:The Buzzing consider The Filth to be their antithesis and warn that it is the transmitted signal but not the transmitter. Players will encounter and must combat The Filth and its manifestations many times throughout their explorations. The Filth acts as a virus infecting a being's mind and continuing on to change their physiology. Being infected can cause malformations such as boils, sores and ultimately transforms it's victims into grotesque tentacled monsters. The corrupted become increasingly violent and intent on infecting anything they come in contact with. Even those believing themselves immune through small controlled doses become infected by the corruption of The Filth and no cure has been discovered for those who are corrupted. The true origin of the Filth is still mostly unrevealed though lore to suggest that The Filth has always existed and may be responsible for humanity's accounts of demons, monsters, the cause of mental illness and global catastrophes such as The Black Plague. 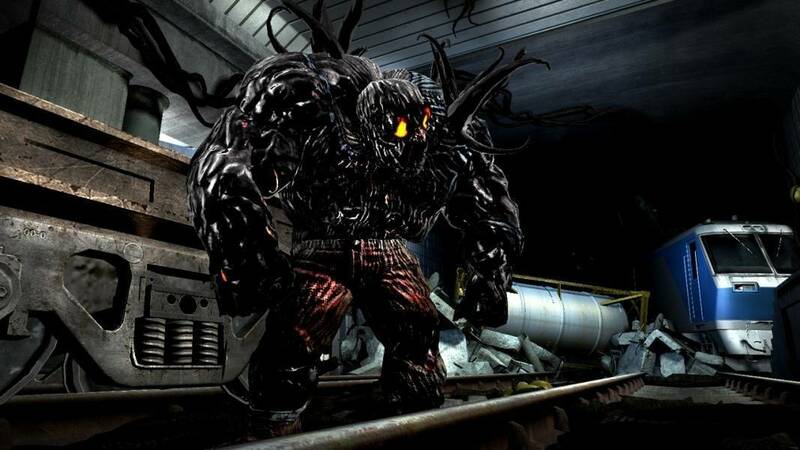 The Filth became a major problem during the Tokyo Incident after which the filth started pouring into the world from the "Outer Dark" in much greater quantity than before, manifesting in multiple locations the player will visit. This is witnessed by the players during the introductory Tokyo Flashback. The Filth appear to have two types of tentacles, one on each end of the body. The black tentacle set, similar to plant roots, seems to anchor the body and second set of tentacles from the ceiling. The second or "leg" set, complete with suction cups, seems to dangle from the body and may be used to trap or possess humans as well as zombies. As seen here in this image of a zombie hulk. Based on video footage, possession by The Filth appears to create a mindless violence in the possessed. The corporate logo for the Orochi Group is thought to be a stylized version of Yamata no Orochi, the eight-headed, eight-tailed dragon of Japan. The first developer diary began with a radio broadcast announcing the Orochi headquarters destruction in Tokyo. "...terrorist attack on the headquarters of the multinational Orochi Group. It's been over a week since the first reports of widespread destruction in this now abandoned commercial district of Tokyo." Toward the end of the developer diary, the The Fallen King sends players to Tokyo Flashback to battle The Filth. One of the earliest sources of information about the Filth can be found at a CDC camp in the Blue Mountains on Solomon Island. Here we learn that the CDC have been shipped in to support the Orochi Group. For more information, see "The Secret World - Secrets Revealed" GDC 2012 presentation, starting at minute 15. In the main mission quest contained in the "Vanishing of Tyler Freeborn" DLC issue, it is revealed from Orochi data that all the town's survivors are in the early stages of Filth infection and already beginning to have its characteristic horror dreams. In the Lore:The Pyramid, the bees refer to Filth as "Oblivion contaminants"
In the mission chain included in the Last "Train to Cairo" DLC issue, undead businessman Said helps the player intercept and then contain an unstable dimensional bomb (Third Age technology) headed for Cairo and thence to London in a presumed attack on Templar headquarters. He does this in atonement for having originally helped Atenist sun worshippers (seen working with Orochi rivals the Phoenecians) to acquire the equivalent bomb used to cause the Tokyo Incident. It is unspecified whether or not the bomb was detonated in the subway car toward which the player struggles in the Tokyo Flashback before witnessesing a rift to the Outer Dark there and passing out. The Orochi group was mining a breach to the Outer Dark until Samael Chandra subordiante Lily Engel, identified as Lilith, has the operation taken over by Mara's vampire army. It is presumably Chandra's voice heard rebuking Lilith for her betrayal over the sound system at the Breach at one point in the questline. The events of The Tokyo incident are still shrouded in mystery but it is believed The Orochi Group, under the direction of Lilith may have accidentally (or purposefully) disrupted a Gaia Engine allowing The Filth to spill through into our world. The entry Lore:The Filth states that The Filth is being transmitted but it is not the one transmitting. Who or what might be controlling The Filth is still unrevealed. Originally introduced as a threat in the first developer diary, more details emerged during the Ten Ton Hammer interview at gamescon 2010. Here, Ragnar Tørnquist explains that The Filth are considered one of the primary evils that players combat against and are definitely linked to the Tokyo Flashback location. This page was last edited on 14 June 2016, at 04:43.